Governor Parris Glendening's Chief of Staff Major Riddick. 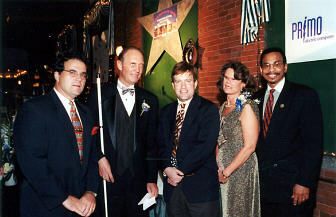 NEWSLINE® Night in Baltimore this year was September 21, 2000. The festivities began with hors d'oeuvres in the dining room while guests examined the items available for bidding at the evening's silent auction. When dinner was ready on the Skydeck, guests walked back down Black Cabinet Hall to the Skydeck entrance and found their outdoor tables. 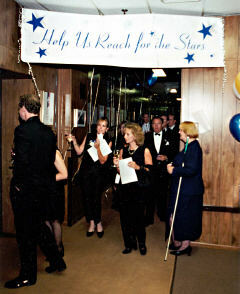 The theme for the evening was "Reaching for the Stars," and stars could be found everywhere in the evening's decorations. A small band played as diners collected their buffet meals and enjoyed good food and good conversation. 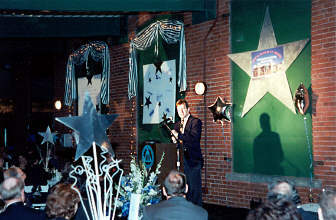 Jim Gashel served as master of ceremonies. The featured speaker of the evening was Frank Luntz, President and CEO of Luntz Research and an analyst for MSNBC. 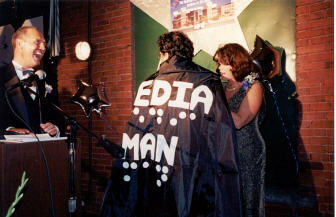 Dan Rodricks, a well-known Baltimore TV personality and now a columnist for the Sun newspapers in the city, has been a longtime friend to the organized blind, so on behalf of the NFB Betsy Zaborowski presented him a one-of-a-kind black super-hero type cape with the words "Media Man" emblazoned on the back in print and Braille. All in all, it was a memorable evening. 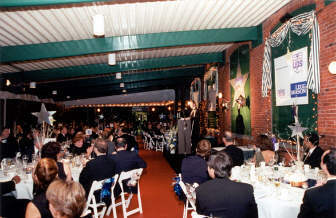 addresses the gathering from the podium. make their way to dinner. their tables at the beginning of dinner.